Classically styled with a comfortable handle and weighty bottom, this monogrammed sports mug holds 2..
64oz Amber Growler with tin twist off cap.Size: 64ozPersonalization: Personalized with up to 2 lines.. Your vintage of choice will look refined and delectable within the confines of the Bormioli Rocco Lo..
Partake of the sophistication inherent in Italian society and usher some of it into your own h..
Give a set of these stylish Ferdinand Mugs to your groomsmen or anyone who appreciates the fine qual..
Personalized Set of 4 Stemless Wine Glasses is a must-have for the wine lover.SIZE: Each glass holds..
Lowball Shot Set comes with two lowball glasses and two shot glasses. Lowball glasses hold up to 8 o..
Classically styled with a comfortable handle and weighty bottom, this monster monogrammed sports mug..
Give a large gift from your great big heart. A crazy amount of your favorite beverage fits into the ..
Classically styled with a comfortable handle and weighty bottom, this sports mug holds 25 fluid ounc..
Personalized Beer Growler with twist off cap.SIZE: 64ozPERSONALIZATION: Personalized with 1 Letter (..
Personalized Beer Growler Set. Includes 4 pint glasses and 1 64oz Personalized Growler with twist of.. 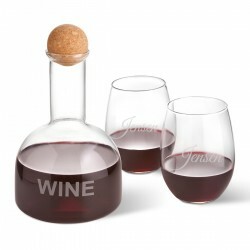 The set is completed by two personalized stemless wine glasses, graceful in shape but sturdy enough ..
Sip your favorite drink from one of these charming Personalized Classic Jar Glasses.MEASUREMENTS: Av..